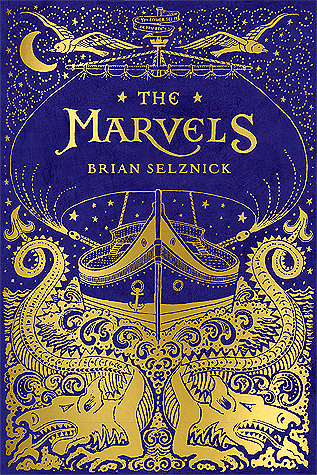 Brian Selznick's The Marvels, weaves two seemingly unrelated stories together using the different mediums of pictures and words. The first part (around two-thirds) of the novel is told entirely in pictures. Beginning in 1766 it charts the voyage and shipwreck of Billy Marvel, and the generations of Marvel actors who follow. The second prose part begins in 1990 and centers on Joseph, who has run away from boarding school to live with his uncle in his mysterious London home. Let me begin by saying that I adore this book! Being my first experience of Selznick's literary work, I was awed by the difference in approach to storytelling. My daughter and I "read" the first part of the book together at bedtimes, marvelling over the detail in Selznick's illustrations; the subtle implications of the plot. The second part I read alone, finding the change of pace a little difficult at first. Several chapters later, the mysteries began to draw me in. I found myself unable to stop reading, yearning to know what would happen next. And by the end... such a twist in the tale! On which I didn't see coming, despite the clues being there all along. The final parts of the story are truly wonderful, particularly the ending, but I won't spoil this review by offering any detail (and strongly encourage you not to skip ahead, lest you mean to deny yourself the impact of those final words). This beautiful volume takes pride of place on my bookshelves, and I hope it will delight both my children and grandchildren for many years to come.